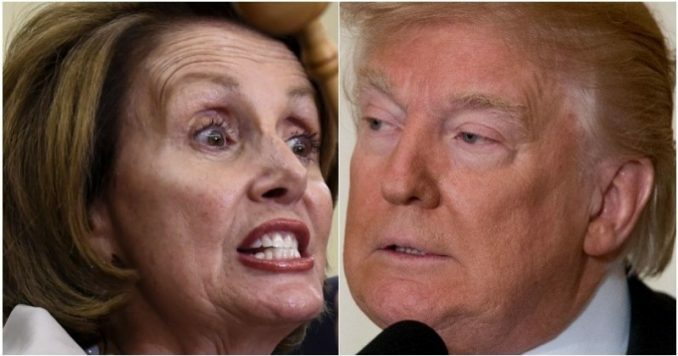 Nancy Pelosi is suing President Donald Trump to prevent him from transferring money to pay for the Southern border wall, a wall we so desperately need. “The President’s action clearly violates the Appropriations Clause,” claimed Pelosi. Yet we have DHS Secretary Kirstjen Nielsen warning the crisis is now at a “system-wide meltdown” with one million migrants headed to our border by years end. Well, the president just made the Speaker regret her ridiculous lawsuit. You’ll love this. In a totally political move and one that goes against our national security, the House Speaker is wasting time and money to sue the president and stop him from transferring money to build the border wall. “The President’s action clearly violates the Appropriations Clause by stealing from appropriated funds, an action that was not authorized by constitutional or statutory authority,” Pelosi, the top Democrat in Congress, said in a statement. Then, the California Democrat claimed Americans were backing her lawsuit. “The president’s sham emergency declaration and unlawful transfers of funds have undermined our democracy, contravening the vote of the bipartisan Congress, the will of the American people and the letter of the Constitution,” Pelosi said. However, support for the wall is reaching an all-time high, reported the Washington Examiner. Now, even Democrats like former Obama official Jeh Johnson is admitting we have a real crisis. “Jeh Johnson, who served as President Obama’s Department of Homeland Security Secretary said ‘we are truly in a crisis’ at the Mexican border Thursday on MSNBC’s Morning Joe,” Real Clear Politics reported. “On Tuesday, there were 4,000 apprehensions. I know that a thousand overwhelms the system. I cannot begin to imagine what 4,000 a day looks like, so we are truly in a crisis,” Johnson explained. Well, President Trump has the most important man on his side, his Attorney General Bill Barr. According to Yahoo News, “U.S. Attorney General William Barr said the president’s emergency declaration was legal.” This means any suit Pelosi throws as an attempt to stop Trump is just for show. And the president was utilizing his powerful Twitter account with 59 million followers to get his message on the border and the Democrats out to the public. “Congress must get together and immediately eliminate the loopholes at the Border! If no action, Border, or large sections of Border, will close. This is a National Emergency!” tweeted Trump. He followed that up with tweeting out an article: “Democrats need to help fix the border crisis or get out of Trump’s way.” This is a clear message to Nancy and her Democratic cohorts that they are going against the will of the American people. Under Nancy Pelosi’s leadership, the Democrats in Congress are making the border crisis the hill they are willing to die on. They are for open borders. And even though the majority of Americans are against open borders and are for building the wall, these swamp rats are only focused on one thing: retaining their power. They see illegal aliens as their new constituents. They would love to grant amnesty to the 10-20 million illegals residing in the United States right now. Since the Democrats can no longer appeal to middle-class working Americans, they believe they must do all they can to leave the border the wide open and then, in the near future, give the illegals the right to vote. Well, that’s exactly why Trump won in 2016, and it’s why he’ll win in 2020. Make sure your family and friends know, the Democrats have this sneaky plan.